If you're looking for the best external hard drives available today then you've come to the right place. We've rounded up the best on the market in our curated guide, making it easy for you to find the right external hard drive for you. And, you don’t need us to tell you that space is an issue. We all know that regardless of which desktop or laptop you choose, they never have enough room. So connect an external hard drive now and free yourself from manufacturer-imposed storage limitations. The good news is choosing an external hard drive needn’t be a arduous task – it’s mainly a question of capacity, which boils down to how much room you need for your stuff – now and in the future. After capacity, the next thing to consider is if you want a portable drive, powered from a USB socket or a fixed desktop drive that will need a power socket. Portable drives are ultra convenient but you pay a premium for this, where as the desktop drives are cheaper and often offer more space. The third option available to you is an SSD drive, which are becoming increasingly popular as they become more affordable. Solid-state drives are ultra-fast - lots quicker than conventional drives – but you pay extra for that speed, capacities don’t go as high a standard hard drives and you need to get them fitted inside your computer. Which to go for? All in our round-up will give you the room you need, but if we had to pick a favourite, at the moment we are love the Samsung 860 EVO for speed and space. We're also big fans of the Seagate Backup Plus models (see below) but these are the higher capacity, non-portable versions: you still get the speed and reliability that Seagate's known for, but you have to find an extra power socket to plug into as well. That extra power means more capacity and faster speeds of course, so it's not all bad: transfer rates go up to 160 MB/s on Windows or Mac and you can get up to 8TB of capacity here. The optional two-port USB hub on the front is handy for charging gadgets too. This is the first portable SSD Western Digital has put out, combining the high speeds of solid-state disks with the convenience of not needing an extra power socket to get it up and running. The drive's transfer rate speeds top out at 515 MB/s, according to WD. With an eye-catching design and USB 3.1 support, the drives use Type-C connectors but can be used with older USB ports with a separate cable. 256-bit AES hardware encryption is included and the Windows/Mac drives are shockproof too, just in case you drop them. The Lacie Fuel is all about its wireless capabilities and mobile support: you can take this away on camping trips and have it stream files to iPads, iPhones, Android devices or whatever else you're taking along with you, thanks to its 10 hours of portable battery life. Lacie says the Wi-Fi hotspot range is 150 feet or 45 metres and if you want to go the old-fashioned route then the drive supports USB 3.0 as well (Type-B). Up to five devices can access the drive at one time, if required, including Windows and Mac computers. 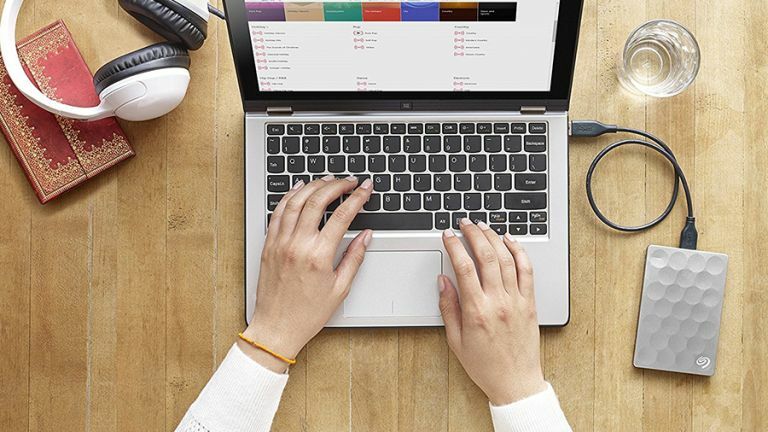 You can pick up Seagate's portable drives in a host of capacities, colours, and dimensions, so head to the Seagate site for a comprehensive breakdown, but across the board you're looking at USB 3.0 speeds, Windows and Mac support, and 120 MB/s or higher transfers. There are some differences: opt for the chunkier, 4TB "Fast" model and you get 220 MB/s transfer rates in return for a little extra bulk on the drive itself. If you just want simple, affordable, reliable backups (software is included), then these are great portable options. If you're happy to leave your drive powered up on the desktop and don't need it to be portable, the My Book series from Western Digital has a well-respected history. The latest models go all the way up to 8TB, which should be more than enough room for your data. You get all the usual WD goodies, including compatibility with Windows and Mac machines, speedy and reliable transfers, USB 3.0 support, and strong 256-bit AES encryption, so they're one of the best options for a standard external desktop drive. The main party trick of this compact, portable, stylish drive from Buffalo is the NFC (Near Field Communication) technology built in, which means you can unlock the contents of the drive with the swipe of the supplied smart card, with no passwords required. On top of that encryption and protection, you also get USB 3.0 connectivity (with integrated cable), shock protection, resistance from water and dust and capacities up to 2TB in size, so if you're looking for a portable drive with a little bit extra, this could be it. The SanDisk Extreme 510 is an unusual-looking portable option if you want the speed of a solid-state drive and don't mind paying for the privilege - note that although the label on the front says SanDisk, the company is in fact now owned and run by Western Digital. That strange casing makes the drive resistant to drops, shocks, vibrations and extreme temperatures, and the manufacturer is promising up to four times faster transfer speeds than a comparable HDD drive. Integrated data encryption is provided as standard too. Samsung has always been ahead of the game with SSDs and now they are back with the 860 EVO – which improves on the original drive and bumps storage up to a colossal 4TB. This huge capacity means if your pockets are deep enough mechanical drives are no longer needed. For this drive Samsung has switched to using V-NAND 3-bit MLC technology for storage, which is very reliable and as a result the 860 EVO comes with a 5-year warranty, which is a great longevity. Add sequential read speeds of up to 550 MBS per second and sequential write speeds of up to 520 MBS per second and you’ve got a fast, reliable and reasonably priced option. We approve. The third WD drive in our rundown is for those who really need a lot of capacity and are happy to pay for it - as the name suggests, the My Book Duo has two drive bays, so you can slot in two hard disks for a total capacity of anywhere between 4TB and a huge 16TB. Even with the two bays, the drive isn't difficult to configure, and with the standard WD backup software supplied you can be up and running in minutes. If you prefer, you can have the two drives mirror each other, so you've always got two copies of your data. If you're looking for an external hard drive to cope with the stresses and strains of modern-day life then you can't do much better than the bright, padded Rugged model from Lacie, shock and drop resistant to a height of 1.2 metres when not running. It's also pressure-resistant, and comes with automatic backup software and encryption to keep your data as safe as possible. A variety of connection options are included, from USB 3.0 Type-C to Thunderbolt and Firewire, and it's Mac and Windows compatible as well.